This interactive kitchen puts the customer in charge of designing their own kitchen. They choose the cabinets, floor coverings and other materials and see the results live. This may not replace your physical décor samples, but, it will provide the bigger picture of their selections. Physical samples (i.e. 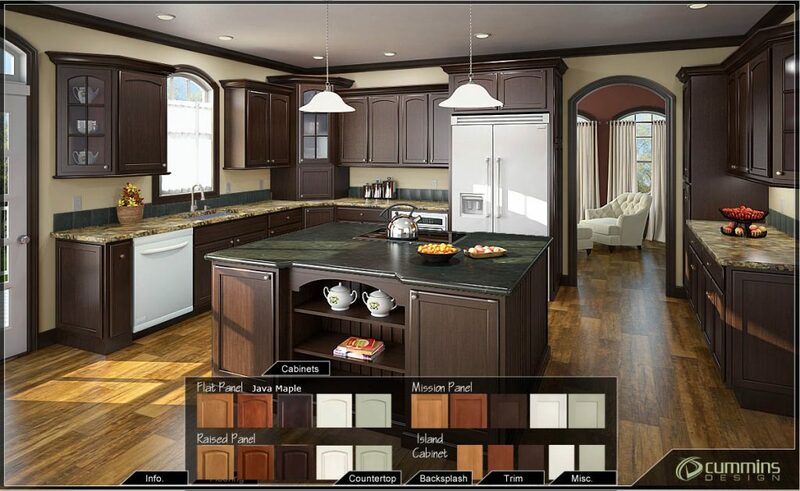 cabinet doors, countertop chips, tiles, etc.) look great in isolation, but when seen in combination, it may tell another story. The virtual kitchen helps alleviate some of those doubts and anxieties. It gives a better picture of the materials that coordinate and which ones clash. In the sample above, there are 3 different door styles with 5 wood species and stains. Countertops get the integrated backsplash, or a tile(6″ or full height) is offered as an option. The island is treated independently. Through the test and trial, the comfort level increases and the customer is drawn closer to a positive decision. Everything in this kitchen is computer generated using advanced lighting and material techniques producing photo-realistic images. It’s a highly controlled environment with huge flexibility in design. This flexibility opens the possibility to introduce things never built before. It’s an opportunity to introduce prototypes, previews and new releases. And it’s perfect for engaging your customers.